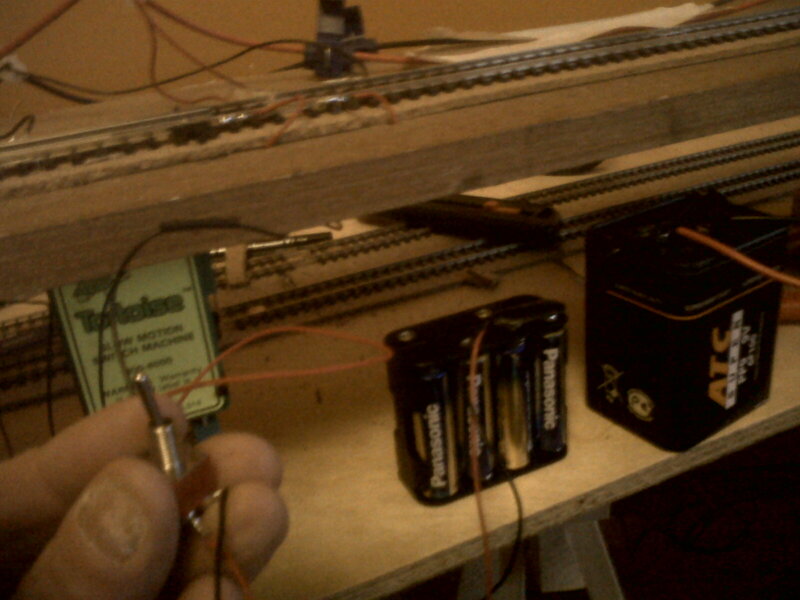 At last, managed to wire up a Tortoise points motor and wire up the test track so that a couple of DC locomotives could run along it and I could change the points by operating a DPDT switch. 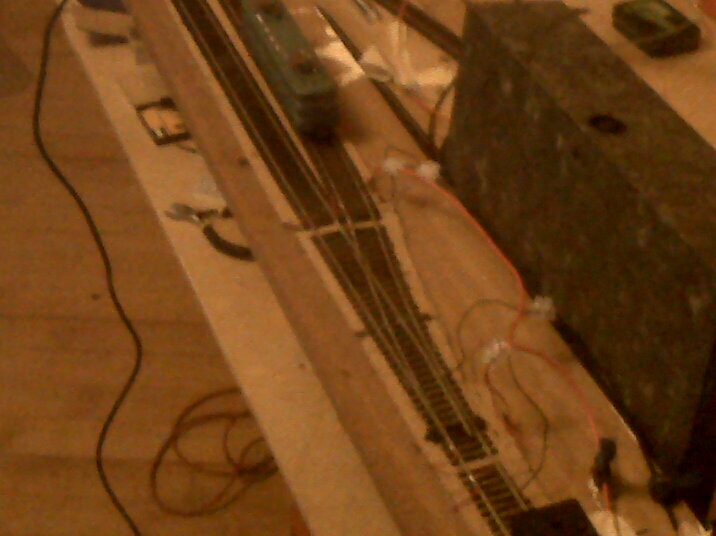 Both of these locos (the black coal tender is motorised and thus counts as a loco) are wired for DC only. In other words, they do not have a computer chip inside and always move if power is provided to the track and always stop when power is cut off from the track. This contrasts with DCC locos which sit on a permanently powered track but will not move unless their computer chip receives a command from a special DCC control unit. 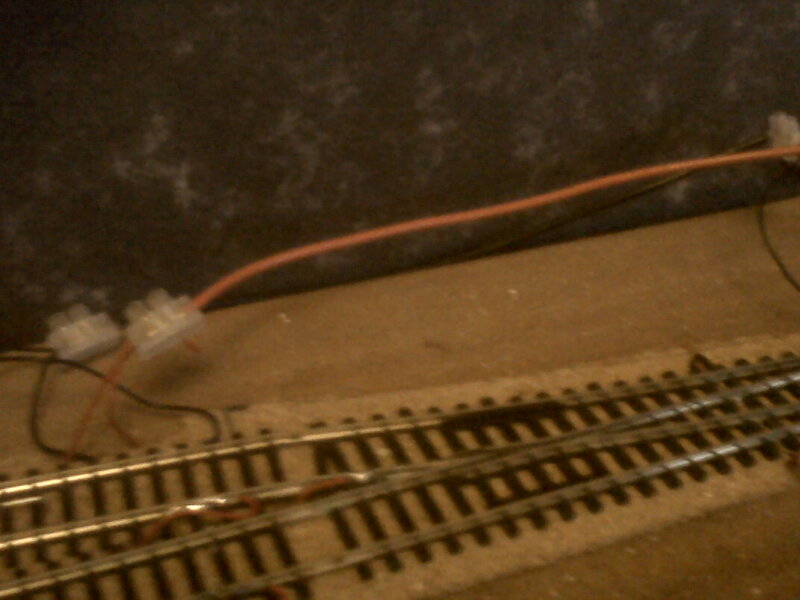 I wanted to check that all of the wiring to the electrofrog points and its points motor functioned correctly BEFORE trying things out with my only DCC loco; the reason being that faulty track wiring can lead to the DCC chip burning out. 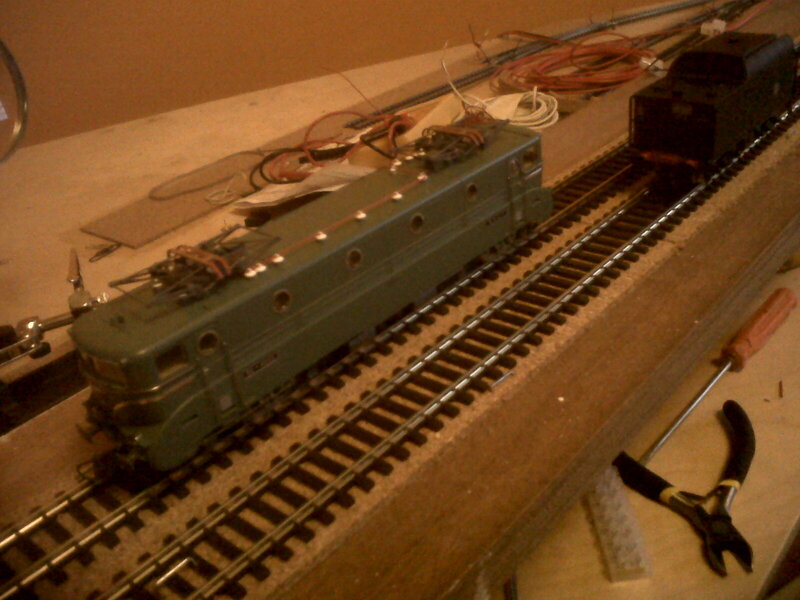 Tomorrow, I will try the same set-up but with the DCC loco and control unit. Once again the snap lock connectors failed and so I connected the feeder wires to the power BUS cables with what are called choc blocks - basically a screw-tightening connection. 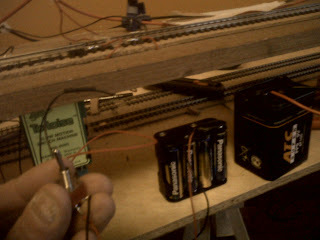 2 DC power sources were required: I used a 9volt battery for the power BUS which powers the track and a cluster of eight 1.5volt AA batteries to power the tortoise points motor. The points motor is operated by a DPDT switch which I actually wired up myself (see earlier blog). You can see the green Tortoise points motor sitting beneath the board and under the points. It is called a Tortoise motor because instead of suddenly flicking the points one way or the other, it slowly changes them one way or the other - which is what happens with real-life points. Once, I have tried out the set-up tomorrow with my DCC loco, I am going to step-by-step refine the test track. 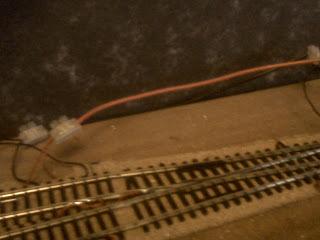 Step one will be to tidy up the wiring and locate it underneath the board. ALSO, I am going to give snap lock connectors one more chance - this time using the set that Nigel Burkin provided when I visited his stall at the recent Model Rail exhibition in Glasgow. He is the leading expert in these matters. Other refinements will be tried out and reported upon in this blog. Visited the churchyard where my parents' ashes were scattered in a garden of remembrance. As I stood there in the quiet surroundings of this beautiful old church, I was reminded of the beauty of the Anglican liturgy - its words and music. I could hear voices speaking those beautiful phrases from the Book of Common Prayer. When I got home I used BBC iPlayer to listen to last Wednesday's Choral Evensong broadcast from Kings College, Cambridge. It reminded me of something I quoted in a recent blog that the purpose of the Anglican liturgy is "to draw people to God through the beauty of holiness."